Wesir all wrapped and ready for the Mysteries. 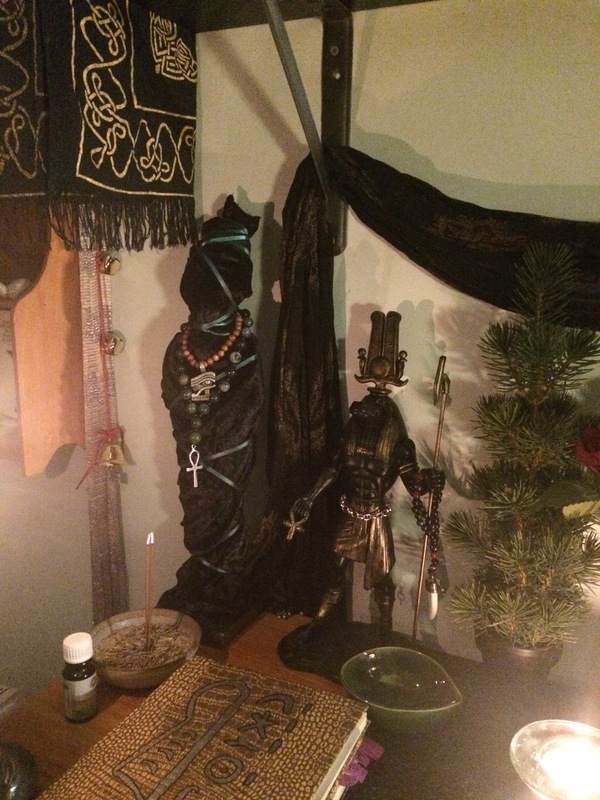 So I wrote a while back about changing the shrines around, but I didn’t want to post about them until they’d settled in. Sometimes, new shrine arrangements need time for me to tweak them, to make sure they are right. Big changes, too, are ones I feel I need to sit with, in case I decide to change them back. So I have given myself a week or so to tweak and sit and practice and figure out what I need to do to make them right, and I think I’m done, for the moment. 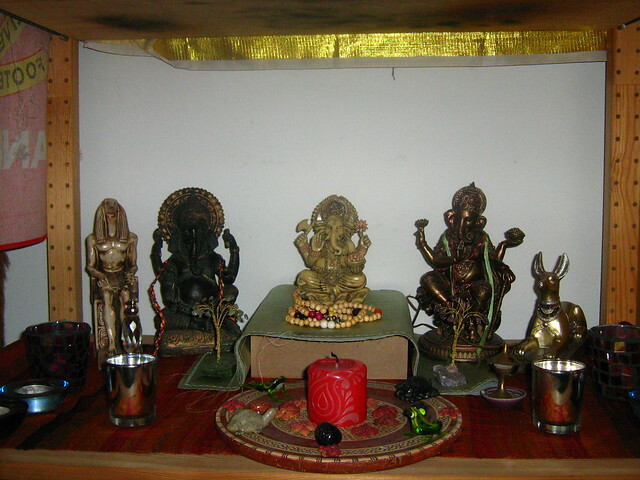 Shrines always change, they never stay the same, so this is no more permanent than my other shrines. It’s just a reflection of where I am in my path right now. I’ve also just got around to wrapping my statue of Wesir. It’s a bit later than I normally do it, given there’s only a week to go. But I noticed the lack of His presence once it was done. I do miss Him during this time, but it’s never permanent. One thing I did achieve today was to go back through the Daybook and pick out all the Mysteries of Wesir-related festivals, and begin compiling something for that. I wanted a more complete picture than the eight-day one I’ve been working with, and going by the dates, I’m actually a few weeks early with mine if I schedule it on May 1, so that’ll be something to think about, whether I keep the May 1 start date, or keep the Kemetic dates instead. I wouldn’t mind moving it so much. It would give me a bit of breathing space to do a more Hekate-focused May 1 High Day rite without it crashing into the Mysteries. Which is not necessarily a bad thing. I would appreciate that, since I wouldn’t need to try to do too many things at once. So that’s definitely on the cards, but nothing’s been decided yet. Ibis, elephant, elephant, elephant, jackal. It’s just an eclectic devotional shrine at the moment, because I have nothing with which to do puja, but I accidentally a mala (it has 108 beads at any rate, even if they’re not all the same), so I can at least start learning how to recite mantras with it. I picked up the central Ganesha icon today because I went into a store and He wanted to come home with me. This is the story of every Ganesha icon I own. All of them are also slightly broken/damaged too. Not sure what that says about me.